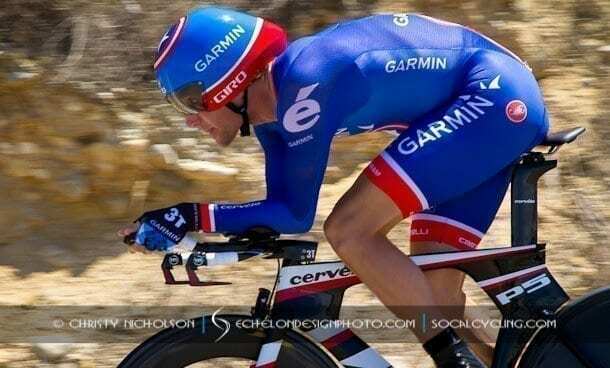 Under cloudless skies and temperatures that reached above 100 degrees, David Zabriskie (USA) of Garmin-Barracuda outrode his competition and into the yellow Amgen Race Leader Jersey during the Stage 5 Individual Time Trial in Bakersfield, finishing in first place with an overall time of 35 minutes, 59 seconds. Coming in 23 seconds behind him was Jens Voigt (GER) from RadioShack-Nissan-Trek. Tejay van Garderen (USA) of BMC Racing Team finished 42 seconds behind Zabriskie and moved into second place overall only 34 seconds behind. Zabriskie took over the lead of the eight-day race from Peter Sagan (SVK) of Liquigas-Cannondale, who has dominated the race thus far, holding the Amgen Race Leader Jersey for four days straight. Sagan, who said he “didn’t feel good from the start,” finished the Time Trial in 52nd place with a time of 39 minutes, 26 seconds. 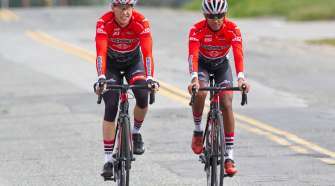 In what many of the cyclists cited as “one of the toughest time trial courses in the history of the Amgen Tour of California”, cyclists raced on an 18.4-mile route that included several 100-foot rollers. 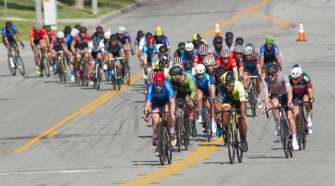 As the cyclists neared the finish, they still had one climb to tackle – China Grade – which presented an eight percent climb to the top and then a hard left. Then, the riders faced a slightly uphill, .44-mile run to the finish. Tejay Van Garderen (BMC Racing Team) and Jens Voight (RadioShack) congratulate each other. As expected, the Individual Time Trial proved to be decisive, shaking up the General Classification standings. Zabriskie now leads the race in first place, followed by van Gardener in second and Robert Gesink (NED) of the Rabobank Cycling Team. Previous race leader Sagan now sits in 31st place. TV Crews film race leader Peter Sagan (Liquigas-Cannondale) as he defends the jersey. Also taking place today was the second annual Amgen Tour of California Women’s Time Trial Race, presented by SRAM. Using the same course as the professional men, the women’s event featured 10 of the world’s best female cyclists, including American Olympic hopeful Kristin Armstrong (USA), who rides for the Exergy TWENTY12 team. It was Armstrong who finished with the best time of 39 minutes, 59 seconds. Alison Powers (USA) of the NOW and Novartis for MS placed second with a time of 41 minutes, 23 seconds, and Jade Wilcoxson (USA) of Optum Pro Cycling Powered by Kelly Benefit Strategies took third with a time of 41 minutes, 58 seconds. The Amgen Tour of California jersey winners. 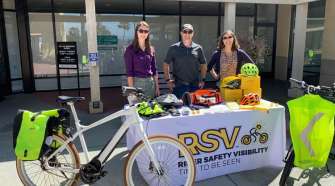 With no Sprint or King of the Mountain (KOM) competitions today, Sagan will now wear the Visit California Sprint Jersey, while Sebastian Salas (USA) of Optum Powered by Kelly Benefit Strategies will keep the Nissan King of the Mountains Jersey. Yannick Eijssen (BEL) from BMC Racing Team remains in the Exergy Most Aggressive Rider Jersey and Markel Irizar Arranburu in the Amgen Breakaway from Cancer® Most Courageous Rider Jersey. Luke Durbridge (AUS) of Orica-GreenEDGE will wear the Rabobank Young Rider Jersey.